20 Card Messages Perfect for Your Season’s Greetings! Flowers are the perfect gift. They are beautiful and one-size-fits-all. They are fun to order and even better to receive. So we have put together some card messages to help you share the love for all kinds of reasons this season. Enjoy! Warm greetings perfect for any celebration. but I’ll never find better friends such as these! Much love to you, my friends. Joy to the World! And all happiness to you this season. May peace find you this season and keep you year round. Wishing you and yours all the magic of the season. Here’s hoping this joyous season is full of many more surprises! These are some romantic card messages that are sure to keep the home fires burning. I trust in miracles this season because I found you, my love. I couldn’t wait for Christmas to tell you how much I love you! My best memories from this year have all been with you. Thank you for being such a wonderful part of my life. You make every day merry and bright. Peace. Joy. Happiness. I have it all with you dear! Here are some sayings to wish someone all the best this new year. 2014 is going to be YOUR year! Live it up! We’ll take a cup of kindness yet, for auld lang syne. Happy New Year! May your past inform your future this bright and shiny New Year. A few phrases to help rejoice in your heritage and share the bounty of the year with loved ones. Wishing you and yours a joyous Kwanzaa! Sharing with you the bounty and blessings of the season. Heri za Kwanzaa! As you observe the Nguza Saba this Kwanzaa, may these colors add to your celebration of past, present and bright future! From our family to yours, we wish you the joy and light of a festive Kwanzaa. Remember to always use a real local florist for the best flowers and service! This all-white flower arrangement reminds us of the shades of winter and is perfectly fitting for January. This would be a great arrangement to order for yourself. Why not bring a little bit of winter indoors where it is nice and cozy? White roses, lilies, waxflower, poms and more are used in this lovely little bubble bowl arrangement. It’s compact design is sure to fit on any space. Know someone who may not be able to get out much during the winter? Why not have a beautiful flower arrangement delivered to their door? This winter-white design would be perfect! Remember, always always always use a real local florist when you send flowers. Not only will you receive the best deals, your community also benefits! Give Cheer for the New Year! Start the New Year off with a bang. Do something unexpected for yourself or a friend — buy flowers. Why? Flowers bring happiness and cheer to anyone who receives them. Flowers are the perfect way to make sure you and those you care about enter the New Year in a jolly mood. Examples of winter & New Years themed flower arrangements. 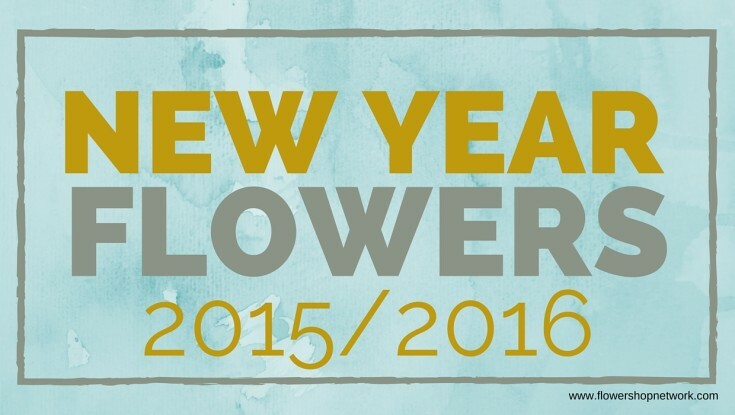 For more on flower meanings and the new year, check out: Let Flowers Symbolize Your New Year. The Chinese New Year is the most celebrated event in Chinese culture. This Year, Chinese New Year starts on January 23rd and lasts 15 days. The festivities end on the 15th day with the Lantern Festival, a celebration of light. The Chinese calendar is lunar based, so this holiday is often called the Lunar New Year. Chinese New Year’s Eve is known as chú xī (除夕). It literally means “Year-pass Eve,” and is also a festive time just like the New Years Eve we have in the States. 2012 is the year of the dragon according to the Chinese Zodiac. Chinese dragons are legendary creatures in Chinese mythology and folklore. In contrast to the ‘evil’ European dragons, Chinese dragons traditionally symbolize potent and auspicious powers, particularly control over water, rainfall, hurricane, and floods. The dragon is also a symbol of power, strength, and good luck. With this, the Emperor of China usually uses the dragon as a symbol of his imperial power. Red is also very important to the Chinese New Year because of it’s legendary ability to fight off evil. If you’re throwing a Chinese New Year party, use lots of red decorations. Yellow and gold decorations are also used for this celebration because it symbolizes luck and prosperity. A beautiful and easy way to decorate for Chinese New Year is with flowers! Order a variety of unique flowers in bright red and yellow with gold ribbon. For more party ideas, check out last year’s article filled with great ideas for your Chinese New Years Celebration!